What’s the first piece of gear you’ll need when getting into hiking? A trusty pair of hiking boots! Having proper support and protection for your feet is very important on the trail, and nothing can wreck your backpacking trip like wearing an ill-fitting pair of boots that cause blisters, crush your toes and can lead to a twisted ankle. When it comes to hiking shoes or boots, almost everybody has a different idea of what’s good and what isn’t; many prefer the support and durability of heavy boots, while others like the freedom and lightweight feel that a pair of low-cut hiking shoes or trail runners offer. There’s plenty of room for personal preference when choosing a pair of hiking shoes or boots, but some kinds are better suited to certain activities than others. Here’s our rundown on what hiking boots you should look for, and how to find the right pair for you.  Types of Hiking Shoes / Boots: Which One Is Right for You? The first questions you should ask yourself when choosing a pair of boots is, what do I need them for? Trail running? Light day hikes? Overnight backpacking? Once you know that, you can ask, how much ankle support and protection do these boots offer, and how much do they weigh? While a pound or two may not make much of a difference in your pack, it means quite a bit when strapped to your feet. The lighter the boots, the less tired your legs will become – but light weight usually comes at the expensive of support. And the heavier your pack, the heavier you’ll need your boots to be. lot of people like to hike in running shoes, but they are often last thing you want to go out in. The plus side is that they are super light, keeping your legs and feet from tiring easily. The downside is that they are easily damaged by rocks and rough terrain, and provide almost no support or protection from twisted ankles. They also won’t be waterproof. 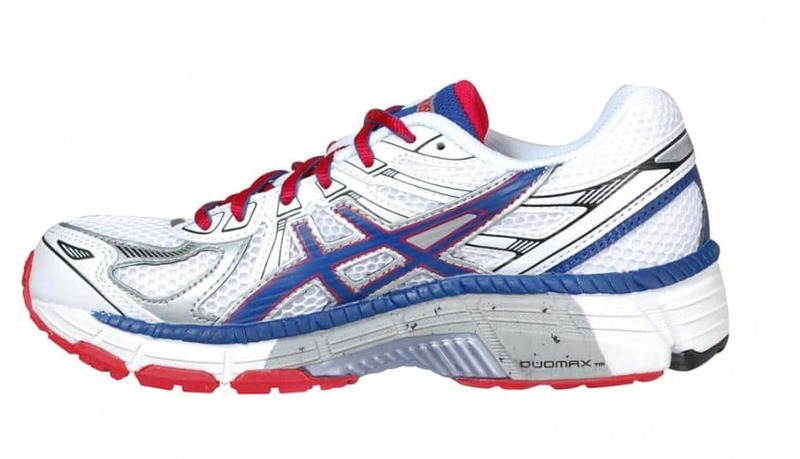 While we would never wear them for anything but the easiest of mountain hikes, we love our Asics GT-2000 runners. They are comfy, and fit our feet like a charm! Trail runners are a step up from running shoes, as they are built to withstand the demands of off-road terrain. You can find waterproof trail runners, and they will usually have a more rugged sole and outer construction to protect against rocks, though this will come at the expense of flexibility. Trail runners will be light and if you’re into endurance running or just want the lightest option available, still make a good option. 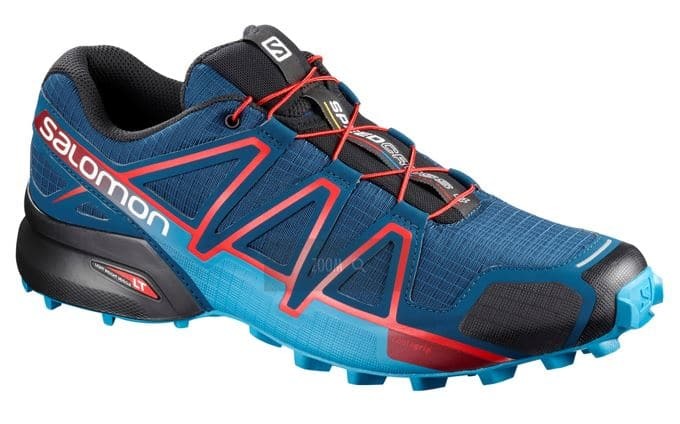 If you’re looking for a dependable pair of lightweight trail runners, the Salomon Speedcross 4 do a decent job; they weigh 10 ounces each and feature a water-resistant upper, with a Contragrip sole, (and they look sweet!). Hiking shoes find a middle ground between trail runners and full-on hiking boots, offering the light, low-cut build of the former combined with the durability of the latter. Usually made of lightweight fabric, they’ll be heavier that running shoes, and less flexible, but do offer more ankle protection. They’ll also often be waterproof. 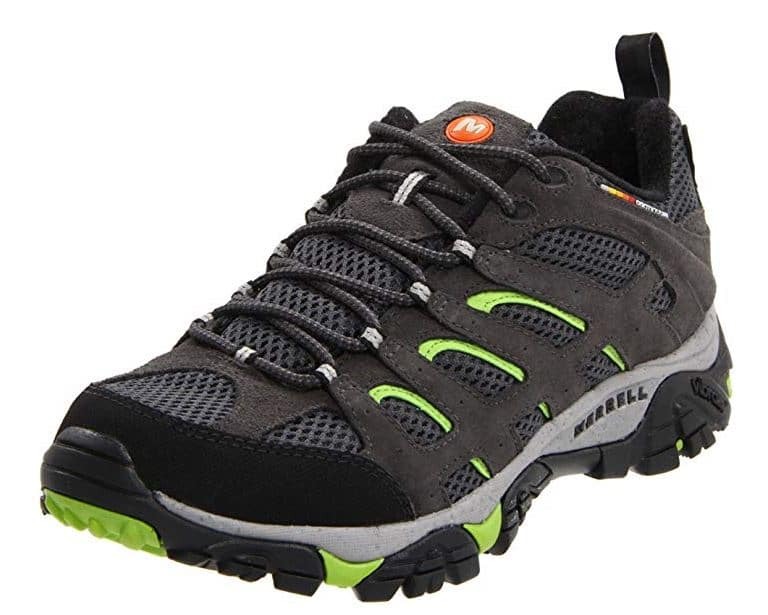 A popular standby set of hiking shoes are the Merrell Moab Ventilators, which weigh about a pound each, have lots of breathable mesh ventilation, and come in waterproof versions. We also like the Salomon X Ultra 3Low, which are bit more rugged and come with Gore-Tex lining, but weigh just 1 lb., 9 ounces per pair. 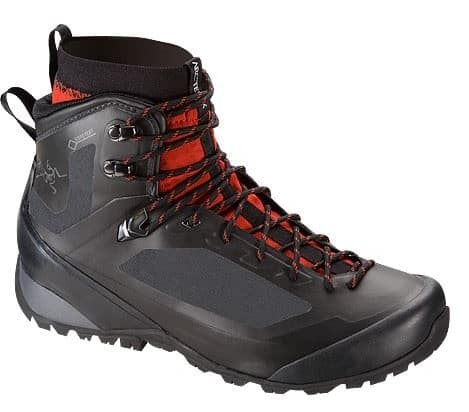 Fabric hiking boots are like hiking shoes in that they’re made of lightweight materials and mesh fabric, but offer the protection and ankle support of a boot. They’ll sit in the weight range between low-cut shoes and full leather hiking boots. Arc’Teryx is working hard to innovate on ultra-light hiking boots, and their new Bora series are pretty incredible. The Bora2 Mid GTX boot compare really well to hiking shoes. They are taller and more protective than standard hiking or trail running shoes. They are also significantly lighter, with heavy leather boots weighing 50% more. The main downside with fabric boots is ability to withstand the punishment of scree, a common feature in many hikes. Another downside that is limited to specific hikers is that they often don’t have the ankle support of leather hiking boots. Leather hiking boots are the heaviest shoes you’ll find, but are the strongest, most durable and will last the longest. They will come at least above your ankle, if not higher and offer plenty of support on uneven terrain. Additionally, their soles will be rigid and equipped for rough, rocky trails. Leather hiking boots are your best option for long, heavy backpacking trips, as they will be the most comfortable with a heavy pack on your back. You will also want a pair if you plan on high-altitude mountaineering trips. The leather construction and tight seams help keep water out, and they regularly come with Gore-Tex or other waterproof membranes for complete resistance to moisture. If you plan on going hard, these are the boots you want. 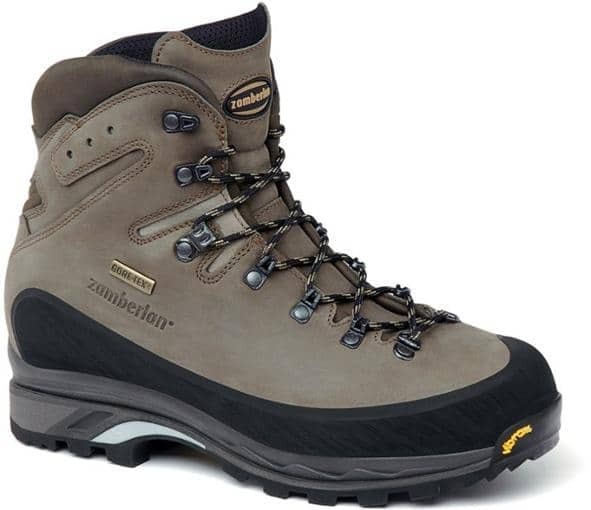 We like the Zamberlan 960 Guide GTX RR Hiking boots, though these are heavy and feel clunky at first. They take longest to break in out of all the options, though they are pretty bomb-proof and can withstand a lot of abuse. The first place you should go to find the right pair of hiking boots for yourself, is the nearest outdoor store or hiking shop. It’s nice to be able to see a few different sets of boots in person, getting an idea for what works for you. Try on a few you like and take them for a spin around the store. Try to go long before any upcoming trips, or at the beginning of the season if possible. You want to have time to go through your options, try on a few different pairs, and break in your boots, before hitting the trail. Once you’ve selected a pair or two of boots you like, get them a half-size or so larger than you would normally; this way, your toes won’t be crushed as you descend steep mountain inclines and you can always wear a thicker sock. Once you get home, wear them around the house for a bit to make sure they fit comfortably, and to start breaking them in. Once you feel more confident they are the right fit, start wearing them for short walks around the neighborhood to get them broken in. You don’t want to wear them for the first time on a hike, and definitely want to avoid wearing them on a serious backpacking trip until they’ve been worn in and start to feel like your old favorite pair. As they get more comfortable, you can slowly graduate to hitting the trails. You may need to try out a few pairs of boots and experiment with different styles before you find the right fit. But once you’ll do, your feet will look forward to the hike, instead of screaming out for a break. Ultimately, each person has different feet and different requirements for how often and in what conditions they will use their hiking shoes / boots. Buying a great pair of shoes or hiking boots will allow you to better enjoy the outdoors.